Discover the waters of the Blue Lagoon. Journey through a spa of the volcanic earth. Harmonize with nature and eat in the Lava restaurant. The Blue Lagoon is on every tourist’s list. So, hate to break it to ya’, but you will not be the only ones there. In order to reserve a spot during your trip, book your Blue Lagoon reservation weeks in advance. We’ve heard way too many stories of people thinking, “I’m sure we could get tickets the day of” – let’s just say, they’re still waiting to go to the Blue Lagoon. How do should you get there? 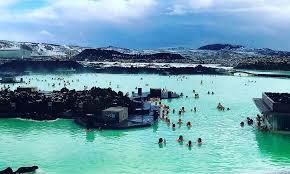 Long story short: The Blue Lagoon is about 50 minutes from Reykjavik and 15 minutes from Keflavik Airport, by car. If you’ll have a rental car during your stay, the lagoon is easily accessible from the main highway. If you’re looking to get a little boozey, there are several airport and hotel shuttles available. The “comfort” package, which is the base package, starts at about 56 USD, however it varies depending on how far in advance you book, popular dates, and time of day. The comfort package includes lagoon entrance, a free silica mud mask, use of a towel, and one drink of choice. If you’re looking for more of a spa experience, “premium” package tickets start at 79 USD, and luxurious “retreat spa” package tickets start at about 234 USD. Why not go straight from the airport? Depending on flight times, it might be a good idea to book your visit for a couple hours after your arrival. That way, you have to time to collect your luggage, find your transfer, and head over to the lagoon. Come on, what says “welcome to Iceland” like a rejuvenating dip in a steamy, mineral-filled lagoon? Not only will an arrival visit feel amazing post-flight, it’ll also save you time and money on transfers, since it’s right near Keflavik Airport. Also, many hotels don’t allow check-in until after 2pm, so it’s the perfect way to kill some time. Don’t let that steamy seawater fool you – the ground is cold. So cold, that walking around without shoes may be painful. Sure, the lagoon offers robes and slippers for sale, but why pay an extra fee for something you can bring along? Stay cozy – in and out of the water. Take a few shots with your “good” camera, then secure it in your locker. Take along a waterproof disposable camera, however, to throw around and take awesome photos in the lagoon! Disposable waterproof cameras average at about 10 USD, and while the quality may not be top-notch, the memories will be. Did somebody say free of charge? In Iceland!? No need to lug along extra hair supplies – take advantage of the rare freebies. The water in the Blue Lagoon is amazing for skin, but it ain’t so nice to hair. Nobody wants the dreaded “Blue Lagoon hair.” The silica, salt, and algae is so strong that it can cause some real damage to your hair. Think: dry and brittle. Sort of like your hair gets frozen, except it doesn’t really unfreeze… yikes. To avoid this, tie your hair up in a high bun, if you can. Of course, it will probably get splashed at some point, but do not fear! Using the conditioner provided, drench your hair and do not rinse it out before entering. Yes, this means a slimey not-so-cute up-do, but everyone else will be rockin’ the same look. When you get out of the lagoon for good, use a clarifying shampoo and wash and condition thoroughly. Voila! Good as new. The Blue Lagoon’s active ingredients (silica, algae, minerals) may be good for your skin, but they are bad for your jewelry. Not only can the seawater accumulate in your jewelry and make it difficult to remove, it will also severely tarnish silver. Also, it may very easily get lost. So, unless you want to ruin or lose your valuables, it’s better to be safe than sorry – just leave your jewelry off. Okay, don’t bring your beloved designer sunglasses because there is a very good chance they’ll get ruined from the strong seawater. Do, however, bring a knock-around pair of sunglasses, as long as you don’t mind them getting a little worn. On sunny days, the reflection of the sun off of the Blue Lagoon can be blinding. Throw on your sunnies and see just fine! Once you’re all rinsed off after a soak in the lagoon, the last thing you’ll want is the silica and sulfur-filled water following you. Whether you’re going straight on a plane, driving back to your hotel, or setting out on another adventure, you’ll always be thankful you put your swimsuit in a plastic bag.